Ever wish you could find a place where you can sit in a nice air conditioned area, drink a fruity smoothie and have your kids be entertained all while you see them from where your drinking that nice smoothie?? I know the places of having all of that are quite limited but let me tell you about a wonderful place where that exists and us parents may even call it "magical'! Storybrook is located on 1538 E 3300 S, Salt Lake city and as you walk in you, you and your little one(s) are greeted and introduced. The entrance fee is ONLY $6 and if you child isn't wearing any socks you pay just a small fee to purchase a pair. You quickly sign a waiver and your all ready to have some fun, and don't worry mom that means for you too! As you come in you will see on your left their boutique where they sell clothes, accessories, and fun little toys as well! Mason was in Ah as to the unlimited amount of toys and structures around us! First we played with Fruit Market area, then we poked our little heads into the houses they had, each one with different designs! Can I just say I may have missed being a child again, but I loved seeing Mason play with all the different toys. 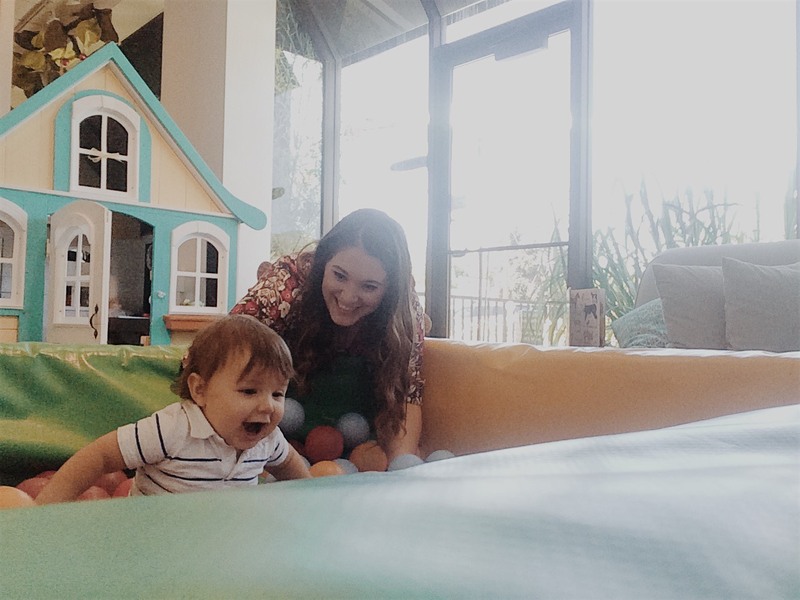 After passing the first half of the play area, mason caught a glimpse to a ball pit, and that was it guys, that was his all time favorite area to be in, and as you can tell by the photo, he had a BLAST! We probably spent a good 20 minutes in there haha. I had to go upstairs to see what their cafe menu offered and mason didn't mind one bit, because he could see me and I could see him as he played and I look at their menu. Before I knew it mason was interested in what mom was doing and so he joined me upstairs.. We ordered a Strawberry Smoothie and shared a chunky chocolate chip cookie. He was such a happy little boy, I mean wouldn't you be?! Not only do they have a cafe and a play area but also a set of comfy couches where us parents can hang and watch our little ones without wondering where their going and not being able to see them. They also have party packages where you don't need to pay a bunch of money on decorations and spend time setting up everything for their birthday party, they will do it for you! They have different themed packages and have special guests that can also attend your child's birthday, like princesses and much more! The fun doesn't stop there, they also have camps you can enroll your kids into and if you want to see more of their boutique, there's much more on their site! Mason and I had a blast and its perfect for anytime of the year and you can relax, eat a snack, and watch your kid(s) have the time of their life! And because I appreciate and am grateful for all of you, I got you a little code you can use for their online boutique, classes and camps. Just use code "Valentina" for 25% off your next purchase! I also linked their website right here ---> Storybrook PlayCafe , and I highly recommend visiting them you wont regret it! Awww, how fun!! !1 I'm gonna have to visit it when we come to Utah! What! This is awesome! I need to take my daughter here! It sounds like an awesome place. I'll have to check it out. I am sure my kids would love it.